Never to shy away from a good and scary freak-out, Lori Meeker brings us one of the most terrifyingly mild pieces to hit Gothtober yet. Visit Day 15, and don’t say I didn’t warn you. 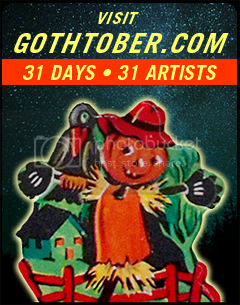 Within the parameters of the Gothtober framework comes a series of images that are sort of kind of disturbing in a mellow sort of way. Watch this piece, and you may begin to feel the edges of your sanity begin to stay pretty much the same, but make you feel… like… 2% uneasy or something. You might finally begin to comprehend the vaguely unsettling feeling people talk about on the news when they’ve just come from a placidly terrifying experience. You may experience no trouble sleeping, not all that much difficulty concentrating, you might think you’re hearing or seeing things, but not in a way that would make you lose your mind, just in a way that’s sort of weird or irksome. And it’s funny, did I mention that? Go see! IT’S MILDLY TERRIFYING, WATCH OUT!! !